Trevor Mann said he will return to Britain after leaving Mitsubishi as COO at the end of this month, 34 years after joining Nissan. A new position within the Renault-Nissan-Mitsubishi alliance, discussed with Carlos Ghosn, would have placed Mann closer to his family in Europe. 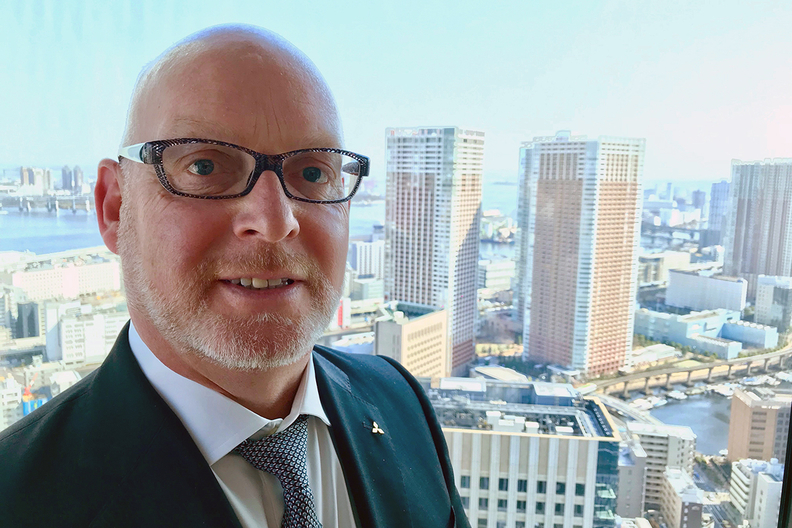 TOKYO -- Trevor Mann, the outgoing COO of Mitsubishi Motors Corp. and longtime Nissan production and purchasing guru, says his envisioned career path went off track when Carlos Ghosn, his boss at both companies, was abruptly arrested last year and ejected as chairman. Mann, 57, expected to be preparing, at this stage in his career, to take a newly created senior-level position within the Renault-Nissan-Mitsubishi alliance in either Paris or Amsterdam. That position was part of Ghosn's wider plan for knitting the alliance more closely together. It was envisioned as something akin to a competitive officer for the entire group, charged with pulling together engineering, manufacturing and purchasing at the three companies, Mann said. And critically, Mann says, the new position would have brought the British-born executive closer to his wife and four adult children, after seven years of being stationed in Japan without them. Mann would have started sometime in the fiscal year from April 1. Instead, the plan unraveled following Ghosn's stunning Nov. 19 arrest. Mann detailed the denouement in an interview on Wednesday, just a week after the surprise announcement he would be leaving the group. "Now, there is no role within the alliance of a similar standing," Mann said from the 30th floor of Mitsubishi Motors' gleaming new global headquarters overlooking Tokyo Bay. "There's no role. So, then I need to decide what I do with my life. So, it goes back to the family." Mann said he will return to Britain after leaving Mitsubishi at the end of this month, 34 years after joining Nissan as a team leader at its assembly plant in Sunderland, England. Replacing him as Mitsubishi COO, effective April 1, will be Ashwani Gupta, currently senior vice president for global commercial vehicles at the Renault-Nissan-Mitsubishi alliance. Mann is one of several high-level executives leaving in the wake of Ghosn's removal as chairman of Renault, Nissan and Mitsubishi. Also out is Vincent Cobee, 50, who joined Mitsubishi from Nissan as corporate vice president in charge of product strategy. Arun Bajaj, 48, global head of human relations for the Renault-Nissan-Mitsubishi alliance, left March 11. In January, top Ghosn lieutenant Jose Munoz abruptly resigned from his post as chief performance officer and chairman of the company's China operations. He was earlier in charge of Nissan's North America business and was tipped as a future Nissan CEO. The same month, Roland Krueger, former president of Nissan's luxury Infiniti brand, also left the company, to take a position heading up Dyson's upstart automotive unit. Mann says his departure is not part of any purge of real or imagined Ghosn loyalists. Yet Ghosn's downfall nonetheless set up a difficult decision, he said. Mann could make good on the promise to his family to return from Japan, or he could linger on, waiting for the alliance restructuring to sort itself out, with still uncertain prospects for his own career path. The veteran engineer and globetrotting executive says family was the natural choice. "I've lived away from them too long. It's a personal decision to go back," Mann said, adding he had the blessings of Mitsubishi CEO Osamu Masuko and Nissan CEO Hiroto Saikawa. Mann said he and Ghosn began discussing a move back to Europe in 2015, the year after he was appointed chief performance officer at Nissan. But when Nissan took a controlling 34 percent stake in Mitsubishi in 2016, plans changed. Ghosn asked Mann to stick around longer — 18 to 24 months — to help get their new partnership with Mitsubishi off the ground. As the two-year mark approached, they agreed Mann would finish the current fiscal year ending March 31 at Mitsubishi before transferring to Europe with the alliance, Mann said. Mann said he wasn't offered the CEO post at Mitsubishi, a title held concurrently by Masuko, who is also chairman. Mann said the alliance potentially loses without a joint operational leader, like the one envisioned by Ghosn, who would pull together disparate functions and tease out new efficiencies. "It's really to take a more helicopter view, not only of the individual converged functions but across the functions," Mann said. "I thought it was a very good, logical idea to have this helicopter operational view for somebody to understand how better to draw each of those functions together across the three companies ... There is still a lot to do." But he said there are also other ways to tackle that task. “There’s more than one way to skin a cat, and that was the idea at that time” Mann said. “We’ll have to wait and see what ideas come out of the new alliance way, the Alliance Operating Board." Now, Mann says he will be moving back to Europe without a job. "I'm going to sit and contemplate," Mann said, adding that the auto industry "is all I know." Mann said he learned about Ghosn's arrest moments after it happened, just as Mann was about to board a plane from the Philippines back to Japan. He saw the first headlines on Yahoo News, and a Japanese colleague traveling with him said: "Oh, it's fake news. Don't worry." Mann says he respects both Ghosn and Saikawa, long-term colleagues now pitted against each other in a high-stakes dual of corporate intrigue, as strong leaders. "I think they're both great leaders, in terms of operational," Mann said. "They have direction. They can motivate their teams. They are very straight, which is what I like."